I am long cash, 2-year Treasuries, physical gold and silver, and GDXJ. Happy New Year, MI. How are you doing? Is the weather giving you any trouble? Let's see where things go from here. I’ve been indoors since November. The last several days have seen below zero F wind chill. When I went to storage to warm up the Winnebago engine, I found mouse terds. I wonder if my housesitting friend is alive. I hope that if he froze to death, he chose to do so elsewhere. I would imagine a thawing mouse carcass does not make for a fresh spring scent. Things are on track, without issues. If anything, bit ahead of schedule. Currently on the sidelines, watching the fireworks while earning risk free interest and saving. My hope is that this euphoria will last couple of years, until the end of 2020 so that I can accumulate a more solid after-tax component. The small index dollar cost average component has done well, at least for now. 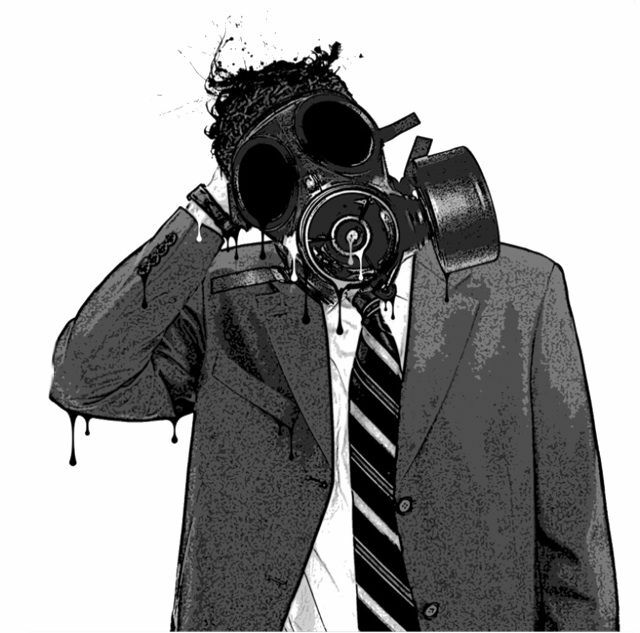 I am in a serious work, save and accumulate mode, while the faux perception is good, until the truth is revealed. Smart man, glad to hear. Ha, and I'm sure your nose will leads you to the right path come spring. Really like your RV idea. I just heard through the grapevine that one of my ex co-worker came to work one day and gave notice on the spot and quit. He was always frugal, driving an old beat up Ford Taurus station wagon and living in a not so desirable neighborhood. People used to make fun of him because he was so frugal even though he earned a decent living as an engineer. And now, he's truly living the life on his own terms in his 40's while the rest will slave away until their 60's. It's time to awaken. Gave me a jolt when I heard this - hit so close to home. Here's another way to evaluate. For pension, the risk is not receiving payment while alive due to some unforeseen event. 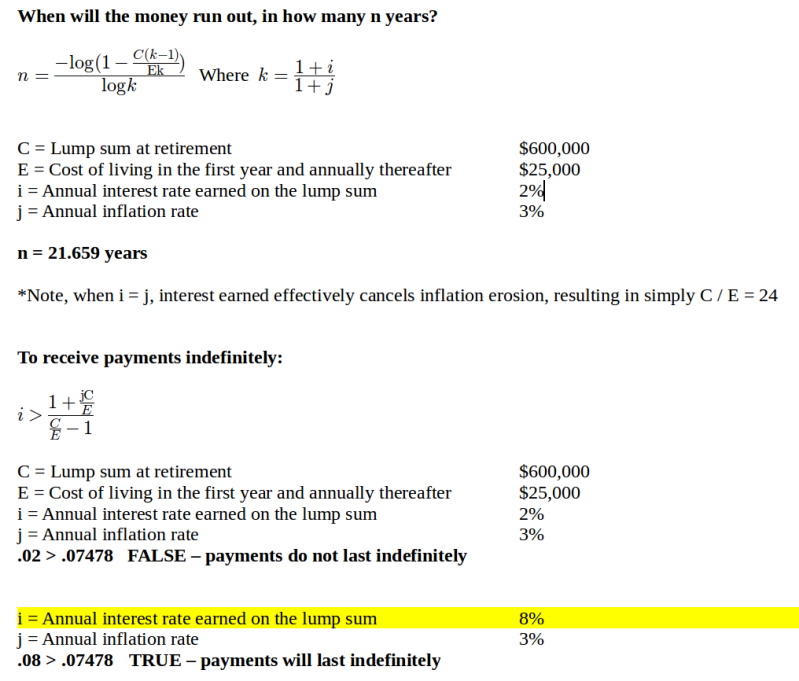 The problem - do you take the pension or lump sum? To help evaluate, we look to the stock market. Many say the average compound annual return of the US stock market from 1926 to 2017 was about 10 percent including inflation (if 4% inflation, then 6% real return). so 10% seems like the magic number. If you already know your monthly pension income amount after retirement, then annualize it (monthly pension income x 12) then divide that number by your total pension contribution. Monthly pension income after retirement - $3000 / mo. 18% is greater than historical stock market return of 10% so the pension may be the way to go. You are getting 18% return on your investment. 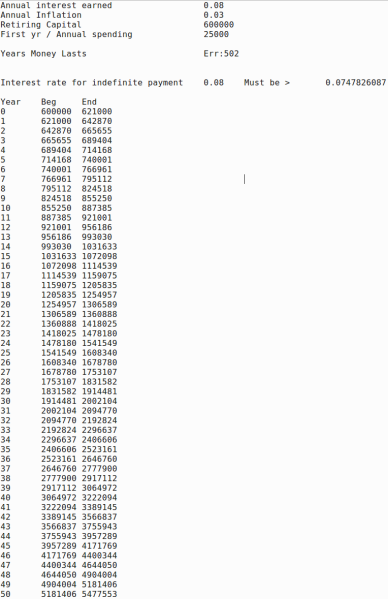 Break-even is (1/.18)= 5.555 years. After 5.555 years you've made even money. The follow up question is, what is the chance of total loss on the investment? If total loss occurs, can you take that loss? What is the percentage of the pension contribution to your total net worth? According to the table, 25% gain is needed to recover 20% loss, which will take about 2.341 years if the market returns more than 10% in 3 consecutive years. Maybe doable. 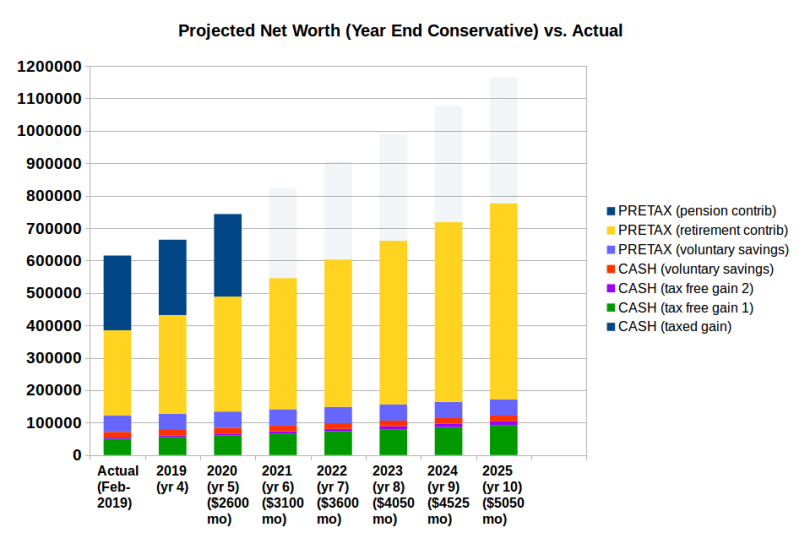 On the otherhand, if you have 500k net worth, then 200k total pension contribution equals 50% loss. 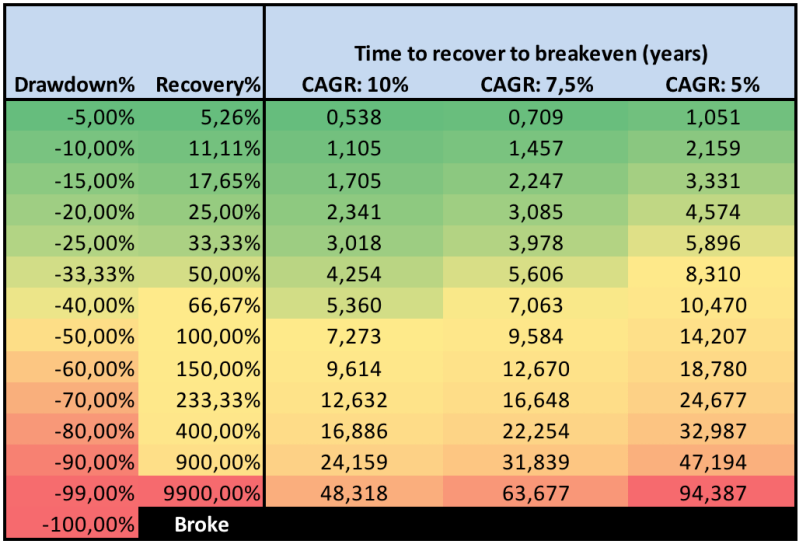 The drawdown table says 100% gain is needed to recover 50% loss, which will take about 7.273 years if market returns more than 10% in 8 consecutive years. Probably not likely. 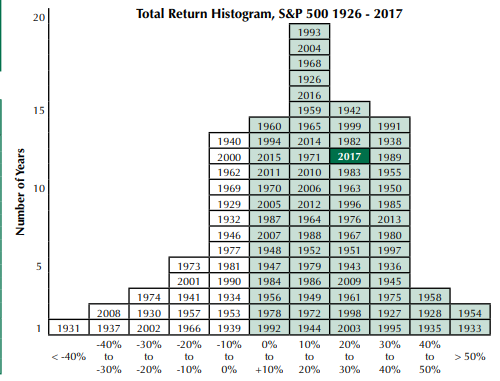 Here's a histogram of market returns from 1926 - 2017. While 10% average return it maybe, consecutive 10% return is probably hard to come by. So the years it will take to recoup that 50% loss will be longer, depending on short term market fluctuations (which could add more loss). But if total loss occurs 1 year after retirement, then the total loss is (200k-36k)/500k or 32.8% loss. If total loss occurs after 2 years, then the total loss is (200k-36k-36k)/500k or 25.6% loss. So the question is, what's the chance of total loss before the break-even period of 5.555 years? And the next obvious question is, will you be alive to care? Because after 5.555 years, there is no risk. Took a small short position today to test the waters. Market is very volatile and treacherous at the moment, so the main focus remains on interest rates such as CD's and short term treasuries. Continuing to index about 5%. I need to start trading volatility like you. But I know someone who claims to have done better by buying NFLX and TSLA puts. Is trading options from a post-tax non-retirement account so bad? I think future tax rates are going to be very high. I would rather pay taxes now. Plus, the leverage I lose by not making pre-tax retirement account contributions can be regained later with directly held real estate. The NFLX/TSLA put guy recommended LEAPs if I went with a post-tax account. Doesn’t the short fall in pensions concern you? The short falls in Social Security? I see the same problems there as with the government deficits. Both problems are intertwined. I would be inclined to take the lump sum. I try not to trade options in a taxable account because of tax complications - questions usually revolve around the wash sale, involving the underlying (stocks) as well as the options themselves (both ways). The other is the options on an index and the difference in their tax treatment - i.e. SPY vs SPX. SPY is an options on an underlying ETF (SPY) and therefore falls under normal options tax rule where wash sale rules can get sticky. SPX is an index option without underlying and therefore tax rules fall under section 1256, dealing with market-to-market rules and 60/40 split on long/short capital gains respectively. I struggle with filing taxes every year as is and the question for me is, is it worth it? Unless one declares trading as a business, where again there are requirements to be met, for me it simply isn't worth the hassle and only makes the accountant happy. LEAPs are very long term options which could last for two year or more. There are benefits with LEAPs in that effects of options time decay (greeks) are spread over a longer period but again, the direction must be correct or else there will be a larger loss due to a much higher premium. Timing and direction are the name of the game in options and despite many fancy elaborate schemes of hedging and spreads, in the end, it is gambling if options are placed without a good understanding the underlying and the top-down economic conditions (i.e. playing the lottery) which many options traders do. The pension shortfall does concern me a little, but I believe I will be able to break-even before that happens. Also, if the situation does occur, then I don't think anyone will be safe (even those holding cash), as the dollar itself will be worthless. Remember, real wealth is in real things - like food, water, shelter, medicine, tools etc. Can't eat paper when you're hungry. Inevitable question that arises as supposed time of retirement approaches is to whether to take lump sum or to take the pension. Valuing the pension, though somewhat subjective, will provide apples to apples comparison by converting the pension to a lump sum equivalent and thereby allowing a reasonable ballpark decision making. So the value of the pension can range anywhere between 360000 to 1300000, depending on the safe rate of return that is achievable in the market place. Therefore for in this case, it is better to take the pension. The break-even point for the pension is: pension lump sum / annual pension income = 200000 / 36000 = 5.555 years. Years it will take to reach likely pension value is: 720000 / 36000 = 20 years. So in taking the pension, it literally pays to live longer. In my case, the numbers aren't nearly as good as the ones in the example but after analysis I am still leaning toward the pension as the potential benefit outweigh the break-even risk, especially over several decades. 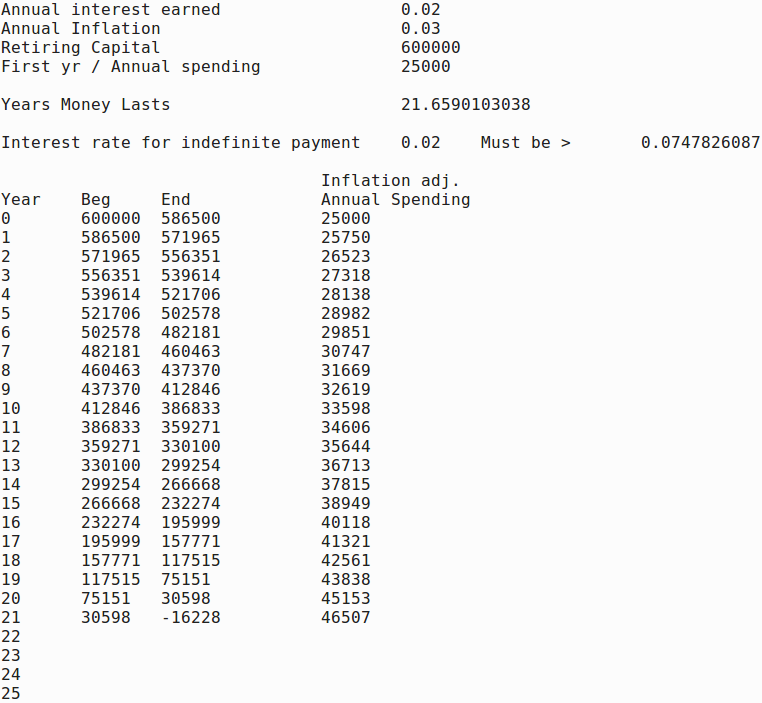 I've also determined that by working several years more, I can shorten the break-even risk by about 30%. Naturally by working longer, there will be additional deferred compensation contributions which is not possible with pension income as it is not earned income. Black-Scholes is the most widely recognized options pricing formula. Options pricing is derived by summing up all the payoffs and their likelihood of occurring by the difference between the stock price and the strike price at the time of options expiration, which is then discounted to present value. The calculation of option price is based on the probability of option being called, modified by possible returns on the stock that give payoff weightings to each probability, using the normal curve. * It is based on log-normal probability distribution. So it's clear that the basic equation does not account for many real world conditions. The result is that there are many different versions of Black-Scholes formulas that offset different assumptions but no single formula works in all cases. Also, the equation used the log-normal distribution for stock price movements. Unfortinately, there are no known statistical distribution models that perfectly describe stock price movements. The log-normal is the closest. This means that there are errors in black-scholes, especially in the edges. i.e. given 1000 days of stock price movements, 3-stardard deviations should cover 99.74% of all stock price movements, covering 997.4 days, leaving 2.6 days that can be expected to fall outside the range, with the market price movement truly going crazy. But in the real market, these crazy price swings can be as much as four times higher than what the model predicts. These are the days when the options writer goes bankrupt. The result is that deep out of the money options will have higher implied volatility than at the money options. There are no perfect hedges in options. The only perfect hedge is a position that is fully closed and out of the market. Any open position, so long as it remains open, has exposure to possibility of loss. Note: Delta neutral positions will lose money given enough time. Because in the real world, there are bid/ask spreads, slippage, commissions and higher interest rates etc., which all must be overcome before profit. The real key to Black-Scholes is the edge* - because this is what Black-Scholes is based on. * What Black-Scholes essentially does is to compute the fair value (fair meaning zero-sum game, no winners or losers on either side, buyer or seller) of an option based on volatility outlook. With that said, here's a journey of a young grad student (at the time) who embarked on a trading journey using leverage through housing crisis, with everything hanging out, guts and all - a fascinating read. Summary: Econ grad student applies Mortgage Your Retirement theory at the top of the last bull market, starting around 2x leverage, loses $210K of borrowed money, and is forced is to sell what's left of his portfolio at S&P 821 in November 2008. The complete wipeout results in a reflective period where he recollects the circumstances that led him to adopt this strategy, some of which will be included in a book. He spends five weeks in Asia and begins writing about how risk and progress can be framed. Returning to the US, he slashes his expenses, finds several ways to increase income, earns 914% on the IRBLTG Fund, and pays off all his high interest credit card debt. Net worth tracker continues to be updated. * 1.4 years to the earliest retirement window. Overall, things are pretty sedentary and I feel fairly calm about the upcoming retirement possibility in 1.4 years. What's really interesting is that the mother of all recessions could trigger within that time frame. But I am not too anxious about it. The reason not to be so obsessed about "making it" to 1.4 years is that there is a back up plan for the worst case, essentially, the FU money. *ACA optimization would entail a careful balancing act between pre-tax distribution, HSA contribution, self-employment pre-tax contribution, self-employment health insurance deduction, pension, small biz and/or housing. The goal will be to stay under 200% FPL if at all possible, or 300% FPL. Maximize Roth conversion while keeping 200%-300% FPL target. That's the blue print. Though a more likely scenario will be that things will proceed as planned and I will be weighing the option to work a bit longer or not for housing or small biz or both. This is a simple model which will allow a quick and dirty ballpark estimate of where things stand given the annual expense, interest rate and the inflation rate. Small biz? What’s the idea? Also, what is the investment that unfailingly outpaces inflation by five percent per annum? It's a great question and a bit complex to answer. It's an attempt to simultaneously address multifaceted issues in retirement, including housing, taxes, inflation, a 3-sigma event, entertainment and a purpose. The key is to start small and learn as you go - with lots of preparations. I'm still combing through the details though the big picture is fairly clear. Will post more as details are ironed out. Answer to the second question is simple - none that I know of. There are no guarantees in investing and if someone does, then don't walk, run away.